ATEN, provider of IT connectivity and total management solutions, announced today that its CS782DP DisplayPort KVM and VK2100 ATEN Control System Box have both been selected by the Taiwan External Trade Development Council as winners of 2017 Taiwan Excellence Awards. The Taiwan Excellence Award is an official accolade presented by the Ministry of Economic Affairs (MOEA) of Taiwan and is the highest honor available to products that encapsulate the quality of “innovalue.” These products are selected based on standards of R&D, design, quality, marketing, and manufacturing. According to the MOEA, 1,188 products from 518 companies participated in the selection process this year. 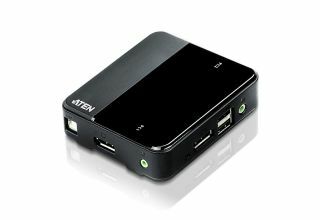 The CS782DP is a two-port USB DisplayPort KVM Switch that features up to 4K UHD video resolution and allows users to access two 4K-enabled computers from a single USB keyboard, USB mouse, and DisplayPort video console, and is well suited for graphic design, animation, and video editing applications. The VK2100, on the other hand, is the primary hub of the ATEN Control System and is where hardware devices are connected to be monitored, managed, and controlled directly via a tailor-made GUI from any iOS, Android, or Windows mobile device.